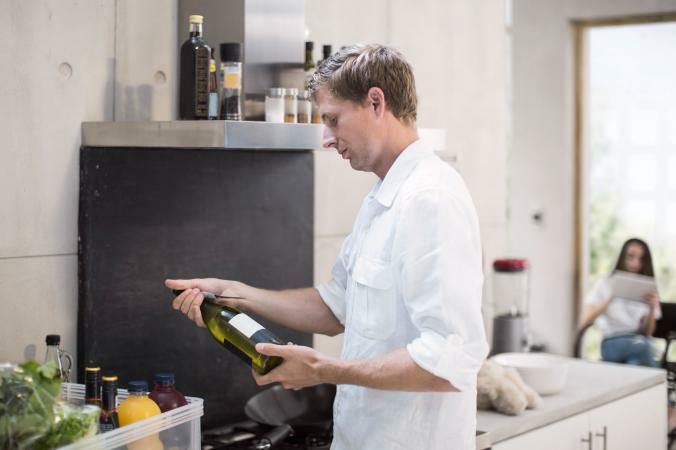 Whether you're collecting labels from some of the best wines you've tried or you plan to reuse the bottle for your own winemaking or another purpose, removing labels can be tricky. Don't just start peeling; you'll end up with a ripped label and a sticky mess. Instead, try one of these easy and much more effective processes. Wine labels can be gorgeous, and they also make great wine cellar decorations or work well in a scrapbook. The challenge here is removing the label without tearing it. If you want to save the label, try this method, which works by softening the adhesive with heat. Ensure the bottles are empty and dry. Remove corks and foil. Place the bottles on the center rack in your cold oven with the label side up. Turn the oven on, setting it to 400 degrees. Set a timer for 10 minutes. The oven will gradually warm up, melting the adhesive that holds the label to the bottle. Your oven may not come all the way up to the temperature you set within the 10 minutes. That's okay. The key is gradually applying dry heat to the label. After 10 minutes, use oven mitts or pot holders to remove the bottles from the oven. Place them on the counter or on a towel. Using a small scraper or razor blade, gently slide the blade under the edge of the label. Do this while the bottle is still hot. Begin to peel the label off the bottle. If you encounter areas that stick, use the blade to help. Use care not to burn yourself with the hot bottle or cut yourself with the scraper. Place the labels, adhesive side down, on the waxed paper. Allow them to cool. If the labels start to curl a little, place a heavy book or pan on top of them to provide pressure. If you don't need to save the label and just want to have a clean, adhesive-free bottle to reuse as you like, you don't need to use your oven. The tricky part here is getting rid of that sticky residue and not scratching the bottle with sharp tools or steel wool. This process will help. Fill a large pot or your kitchen sink with hot water. Pour in about half a cup of baking soda and stir to dissolve. Place the wine bottle in the hot water, ensuring the label is underwater. Let it soak for 30 minutes. Use a rag or washcloth to scrub off the label paper and adhesive. If some of the adhesive remains, soak a washcloth with rubbing alcohol and scrub off the residue. The alcohol will dissolve the sticky stuff, leaving the bottle clean and ready for another purpose. Although the above methods are free, they can take some time. If you're in a hurry, you can try out a wine label remover. These products are basically large pieces of adhesive that go over the label, allowing you to peel it off as one piece. At about a dollar each, these can be expensive, however, especially if you'll be doing more than a few bottles. Knowing how to remove wine labels opens up all kind of creative opportunities. You can save the labels to make custom wine tasting notebooks with impressions of each bottle next to the label, or you can decorate your wine cellar with framed labels of your favorite bottles. You can reuse bottles as candle holders, window decor, or for other creative projects. You can also use them to bottle your own homemade wine by adding your own labels to the clean bottle. No matter what you plan to do, this is a skill that will come in handy as you collect and enjoy your favorite wines.